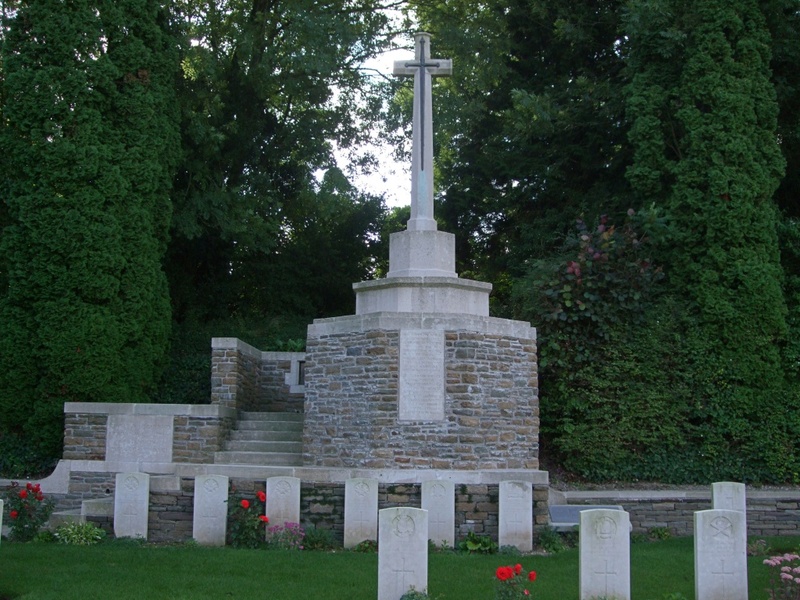 Templeux-le-Guerard is a village in the Department of the Somme, almost 26 kilometres east of Peronne. 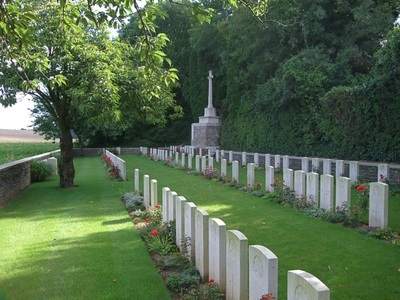 The Communal Cemetery is north of the village on the north-west side of a track running in the direction of Ronssoy and the Extension is at the back of the Communal Cemetery. Templeux-le-Guerard was taken early in April 1917, lost on the 21st March 1918, and retaken by the 15th Suffolks of the 74th (Yeomanry) Division on the following 18th September. 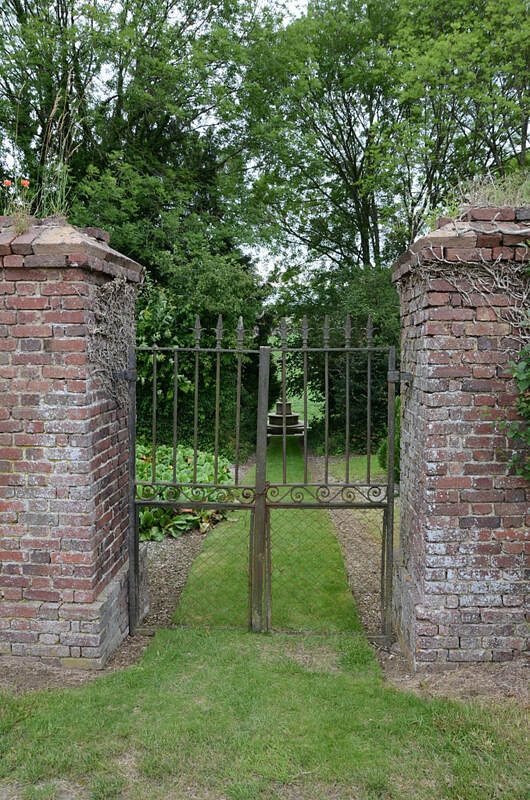 The Extension was begun by the 59th (North Midland) Division immediately after the capture of the village, and carried on by the 34th and other Divisions until October 1917. 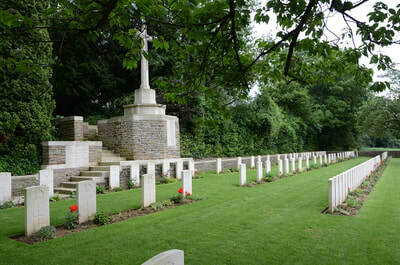 Further British burials were made in it in March,1918 by the Germans and in September and October 1918, by the British. There are now over 100, 1914-18 war casualties commemorated in this site. Of these, a small number are unidentified and a special memorial is erected to one soldier from the United Kingdom who is known to be buried among them. 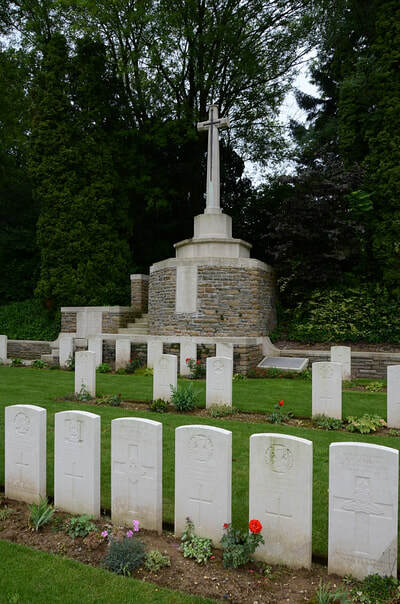 Other special memorials record the names of 12 soldiers from the United Kingdom, buried in the German Extension, whose graves were destroyed by shell fire. 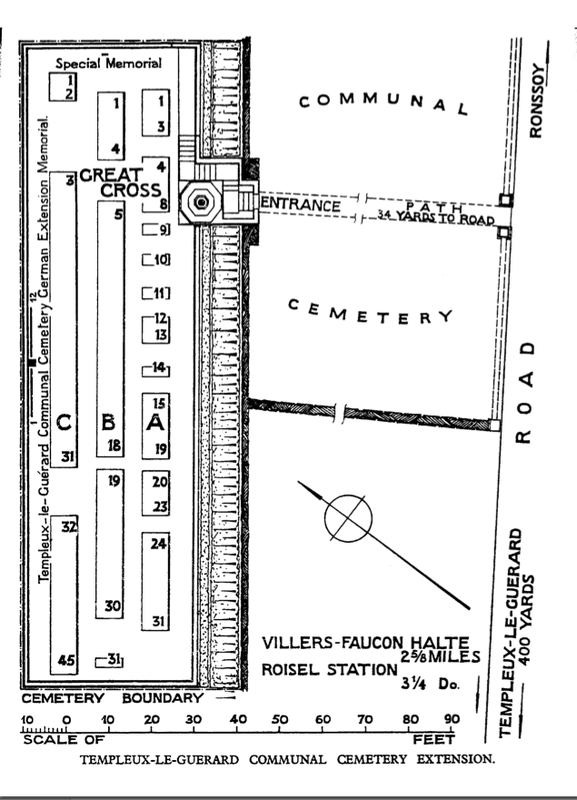 The graves of four United States soldiers and seven German soldiers have been removed to other cemeteries. 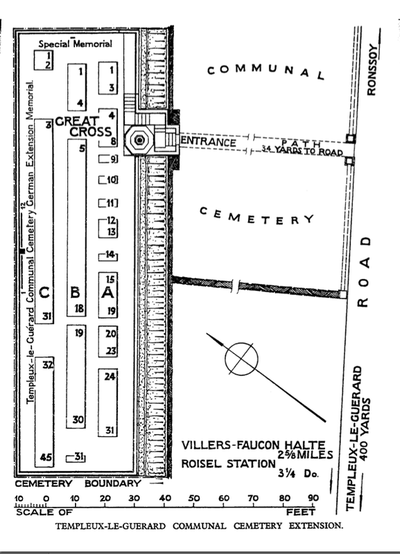 The Extension covers an area of 729 square metres and is enclosed on three sides by a rubble wall. 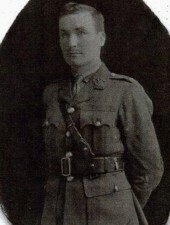 Sydney Herbert Bressey, M. M.
74th Div. Signal Coy. Royal Engineers. 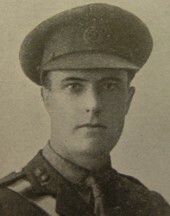 21st September 1918, aged 25. 21st March 1918, aged 35. 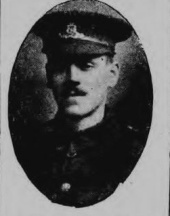 Son of Harry and Martha Darlow; husband of Hannah Elizabeth Dardlow, of "Mill Hill," Gamlingay, Sandy, Beds. Born at Gamlingay. Templeux-le-Guerard Com. Cem. German Ext. Mem. 1. Son of James and Katie Eastwood (formerly Gibbons) born in Joliet Illinois U.S.A, enlisted in the 5th Royal Irish Lancers from Blackrock College Dublin in December 1912, served in France/Flanders with the 5th R .I. Lancers from August 1914 to April 1917 before being commissioned into the 2nd Battalion Leinster Regiment April 1917. He was wounded in the battle of Vimy Ridge on 12-4-1917 and hospitalised back to the U.K. He returned to France in August 1917 and was killed in action on 22-3-1918 at Templeux-le-Guerard where he was buried in Templeux-le-Guerard Communal Cemetery Extension. he is remembered by his sister Annie & the Wall family in Dublin. 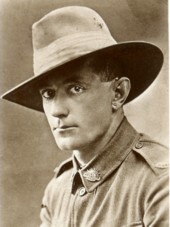 He was awarded 1914 star, British war medal and Victory Medal. 5th Field Ambulance, Australian Army Medical Corps. 3rd October 18, aged 28. Son of Walter and Mary Hannah Teal. Born at Echuca, Victoria, Australia.